Dynamic light scattering (DLS) is an important experimental technique in science and industry. It is also known as Photon Correlation Spectroscopy (PCS). This technique is one of the most popular methods used to determine the size of particles. It is applicable in range from about 0.001 to several microns, which is difficult to achieve with other techniques. This is because the dimensions are too small for optical spectroscopy and too large for electron microscopy. The hydrodynamic radius is one of the main parameters measured by this technique; it gives the size of the molecule in solution and information about its oligomeric state in solution. Also, the polydispersity is an important parameter that infers about the quality of the sample, if it has only one population or more. This is a good technique to measure stability of samples before crystallization or SAXS experiments. 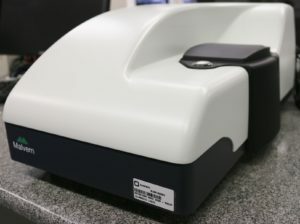 In LEC we have one cuvette instrument Zetasizer Nano. For the cuvette instrument is necessary 20-80uL of sample in concentrations higher than 0.5 mg/mL.